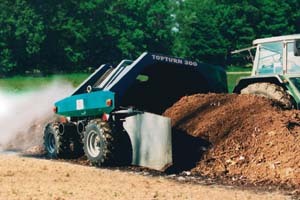 Trailer-operated compost turning machine with professional technology. Continuous independent feeding drive, independent of tractor vehicle - as an option, under difficult operating conditions the outer support wheels can be driven via hydraulic driving wheels. Control of all important functions by means of electro-hydraulic remote control.